In 1978, David Prowse, better known as Darth Vader's body, spoiled The Empire Strikes Back to a cheering crowd in Berkeley, California...two years before Empire came out. But did Prowse actually know the ending, or was this sheer coincidence? [M]y mother was good to keep an eye out for Star Wars news – and when this particular item showed up in our local paper, she cut it out for me. I still have it to this day. And, it was my first introduction to spoilers. 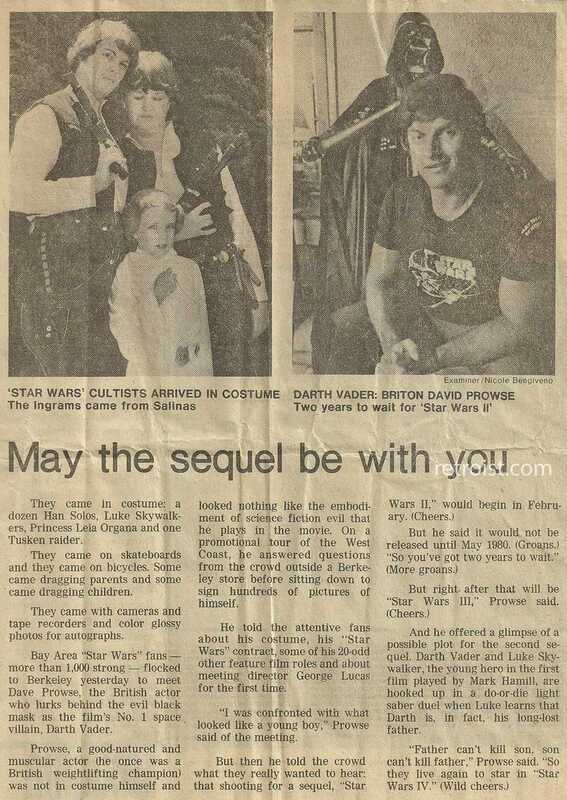 In late 1978, David Prowse revealed that he was Luke's father – two years before Empire Strikes Back hit theaters. In retrospect, I wonder how George Lucas felt about this. Since there was no internet in 1978, he probably never knew that David was running around spilling the beans. The thing is, Prowse probably wasn't aware of Vader's paternity shenanigans. When it came time to film Vader and Luke's battle on Bespin, the script called for Vader to tell Luke, ''Obi-Wan killed your father''; James Earl Jones' real reveal was dubbed in later. So that leaves a strong possibility that Prowse was fabricating spoilers for an adulating crowd of hundreds (he does mention that the paternity twist comes in the third film). Either way, it's pretty hilarious, and the fact that he guessed right is icing on the cake.